I have a ‘thing’ for watering cans, you may have noticed :). . . collected over the years, mostly from flea markets and antique malls. I don’t discriminate, I love the time-worn or chippy. . .
Dented or painted . . .
Rusty or decoupaged. . .
Cans with or without roses. . .
Old or new. . .
And speaking of water, we desperately need some rain. Our lake level is dropping daily. If you have some extra rain, please send it our way. . .
← Heirloom Tomato Tart with Bacon-Studded Crust! I 💜 your collection of watering cans! I have several sitting here & there and for some reason this year the wasp are thinking they need to make them their home. We could use some rain as well and less humidity, please! Love all your watering cans! We haven’t had rain since June and the temperatures are in the 100s so I feel your pain! Here’s hoping we both get rain soon! 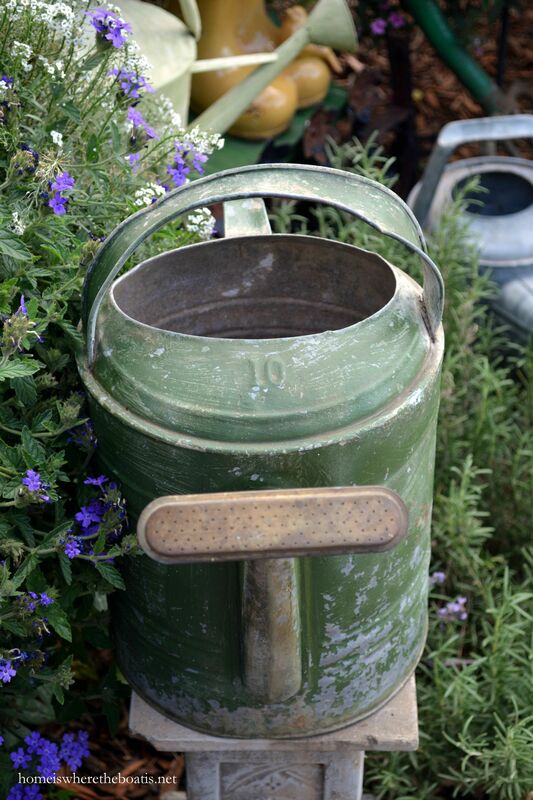 Your watering can collection is wonderful!! I live in Lexington, Ky and we had over 9 inches of rain last month and it is still raining!! Wish I could send some your way. What a lovely collection. I think I love the painted ones best. I wish I could send you rain, it seems to rain every other day here. Mowing is really difficult because you can mow when it is wet and never seems to get a chance to dry out. I think we have watered some of the garden once or twice this summer. 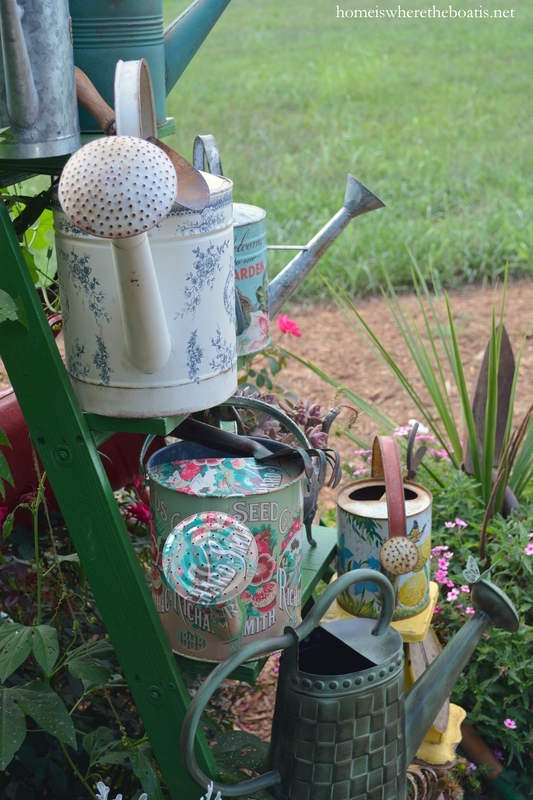 I love my watering cans, too, but your collection is quite lovely!!! love your posts. thanks for sharing!! I LOOOOVE all your watering cans and wish I had a collection. I wish I could send you rain but we need it too, it is dry as a bone here!!! I am lugging hoses as well, every day plus this week watering my neighbors while they are on vacation. Have a beautiful weekend, hopefully a wet one!!!!! This whole setting just makes me swoon, Mary! 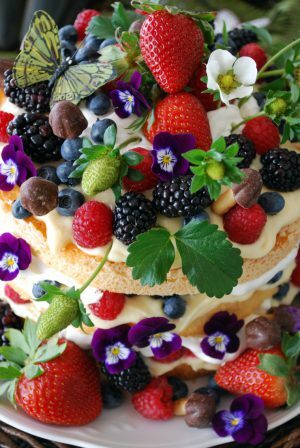 I so admire your ability to gather things so beautifully into such pleasing arrangements. I also love the flowers you’ve got growing around it all…such pretty colors! Gorgeous setting, with the open fields in the background, too. Outstanding! I love your collection of watering cans, Mary! I have quite a collection, myself! My favorite can is a beehive! It’s our rainy season in Fl. We get thunder storms every afternoon! The grass is nice and green, but my flower garden is getting waterlogged. I would love to send this rain your way! Mary, Your watering cans are absolutely adorable, I love each and every one of them. Here in Southwestern lower Michigan we are having a dry period temps currently in the low 80’s. We are blessed that we have irrigation to water our crops. What a wonderful collection, Mary. 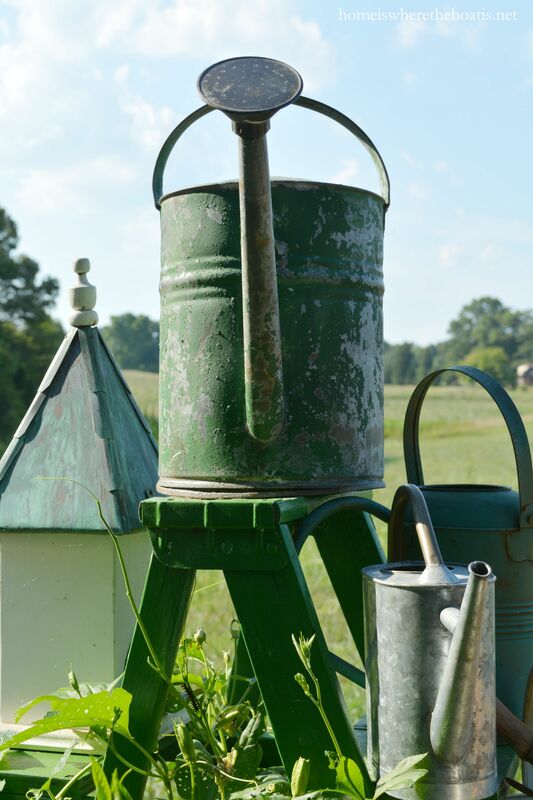 Your watering cans look perfectly happy perched on the ladder by your potting shed. I hope you get rain soon, and we need it here in Texas, as well. The 100 degree days are taking a toll. Love the way you’ve displayed your collection. The shot towards the end of your post with the whole view of your potting shed and your watering can collection is worthy of a magazine cover…Gorgeous! You’ve got a good eye and great taste. 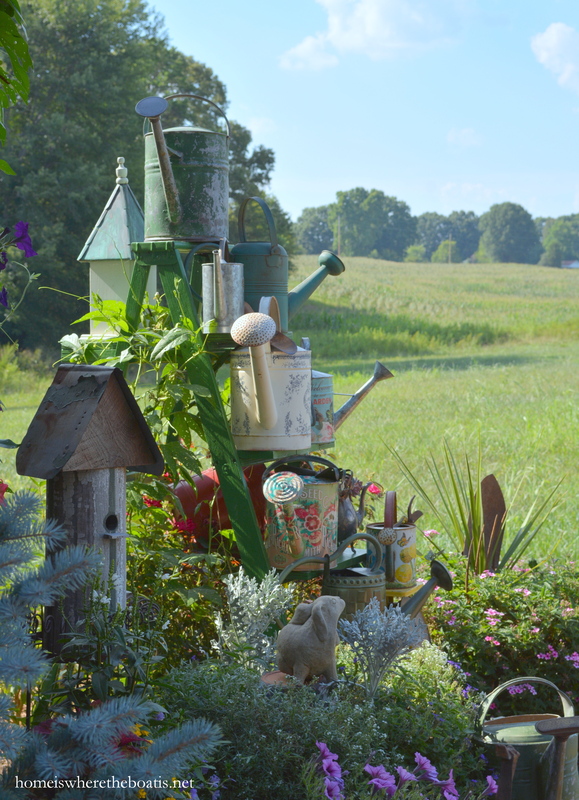 If only those watering cans could talk, what a story they could tell….you have a very nice collection, Mary, that is not only beautiful, but interesting. Perhaps some rain will come along and fill some. The door swag is looking great! Those petunias are beautiful. Enjoy the weekend…. Mary, I’m down here in Texas with Cecilia and Kitty. Our drought was helped this spring when we had record rain, which caused horrible destruction in two towns, but helped in others. Our lake was down to only 3%, but it recovered quite nicely to 80%. I hope yours doesn’t go down that much. But now we haven’t had rain in awhile and with heat indices 105-112, plants are suffering, as are the people. I’m also a watering can collector. The galvanized are outside lining the porch steps and the ceramic ones are inside on display. Always reminding me of the way our ancestors watered their flowers. :-) Thank you for sharing your lovely collection ! Hope you get rain soon…and if you do, please send to Texas, too ! Love, love these photos! Everyone needs a shed in their life, even if we must share yours! Thanks!! I’ve been lugging the hose around much of this summer as well so I feel your pain! i knew you had a watering can collection but I didn’t know it was as extensive and as fabulous as this! And it is all photographed so beautifully and hoping they land in a magazine, too! We finally got some rain last night and I hope you did, too! You have such a sweet collection, Mary. Each time I see one, I think of my grandmother, who used her Sprinkler to water everyday. 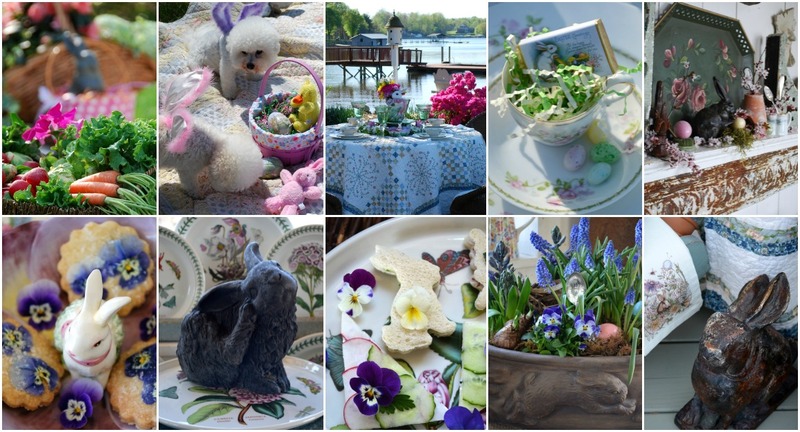 Seeing the litte ones decorated makes me think of precious little girls helping in the garden. I love how you have them displayed on that amazing ladder. 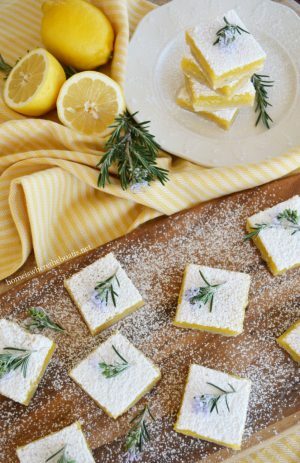 Happy August, Mary! I think I have found a new collection item!! I have one in aqua for my start :-). We bought a handyman special cottage several years ago. Included were a couple of old dented coal buckets, so I love to fill those every year. This post made me smile. I love your collection of watering cans, Mary! 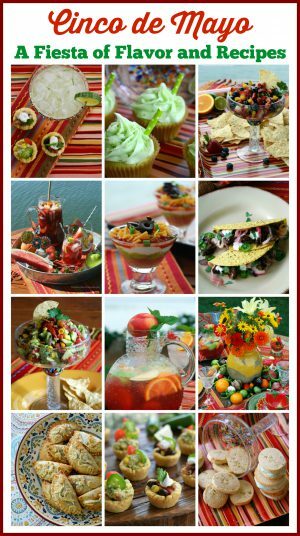 Love your collection…. 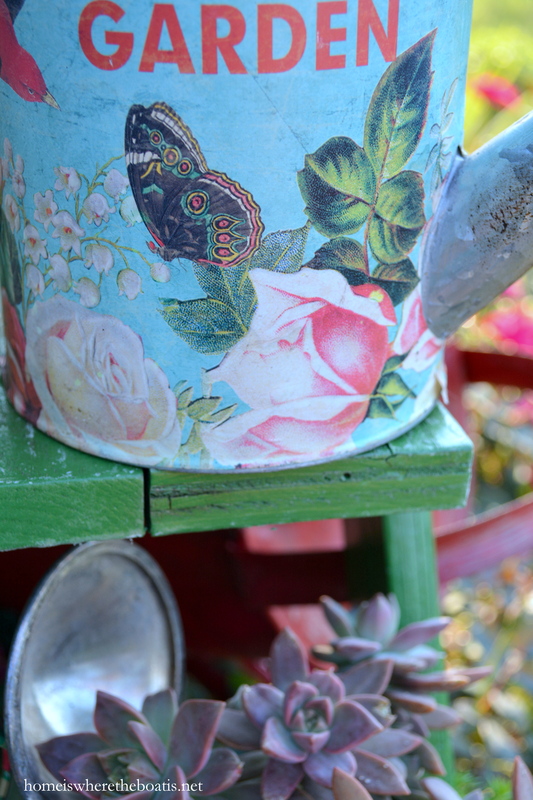 I have only one old one, but love my watering can! Wish I could send you some rain – we’ve had nothing but this last week – due to Hurricane Guillermo who was threatening us but decided to skirt around us…and now Hilda is approaching, but looks like she is losing strength…I do welcome the rain regardless of who brings it as long as hurricanes and tropical storms stay away from our shores! 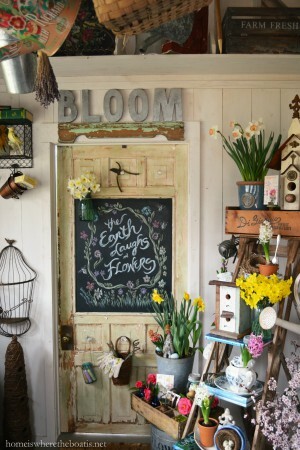 I’m head over heels in love with your charming potting shed!!! 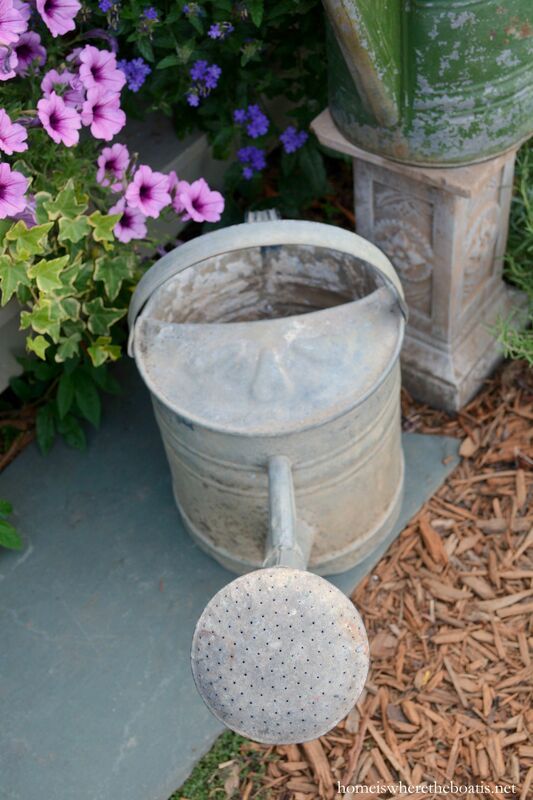 Nothing says flower garden like a watering can, especially a galvanized one! Love this Mary, and up the road in Forsyth County we could use some more rain too! You have such a wonderful collection of vintage watering cans, Mary! I enjoyed looking at them all in your display. You have the most gorgeous potting shed I’ve ever seen!! Love all those watering cans!! 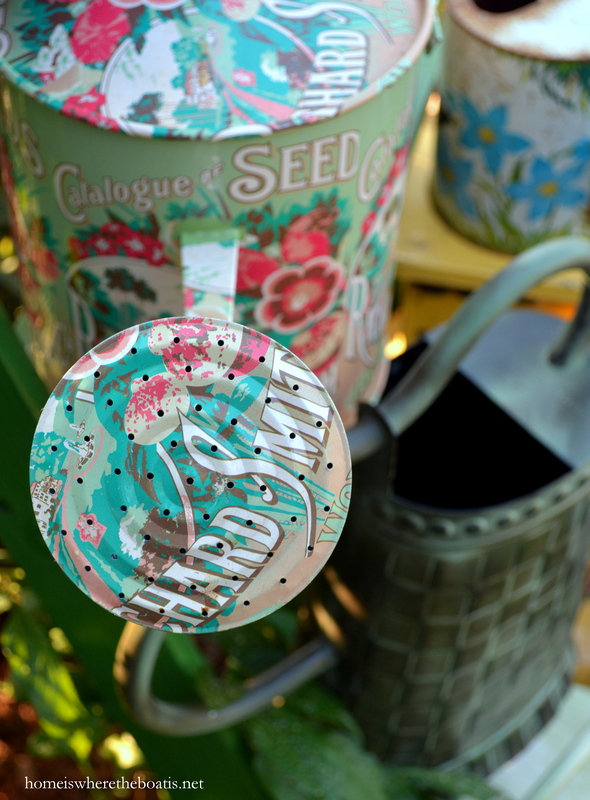 *Perfect* collection for your little potting shed. I love them all, but I think my have is the very first one in the post. I think it has marigolds and a butterfly on it. So cute! 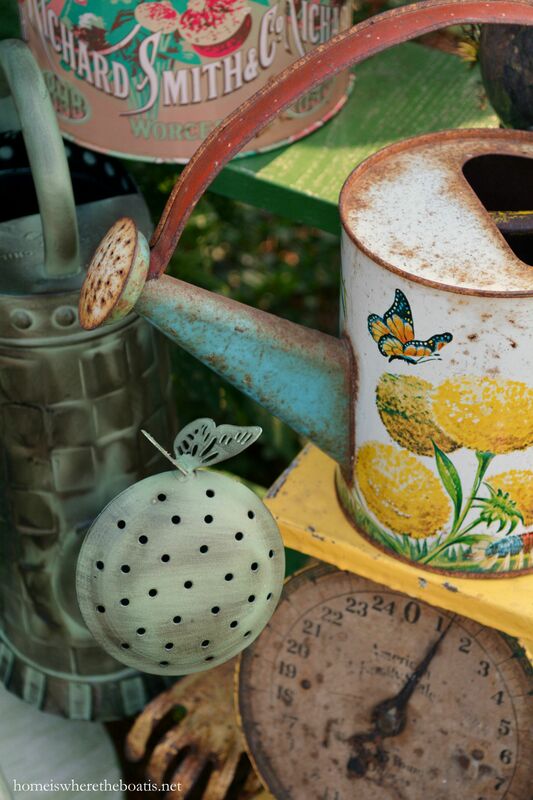 Your collection of watering cans is spectacular! They make me want to start collecting:) As for rain, we need some here, too. I stopped watering the lawn and I’m just watering the garden and the flowers and trees. I started getting afraid that I could be running the well dry and that is not a nice feeling to have. Oh my, I just saw your post at The Scoop party. 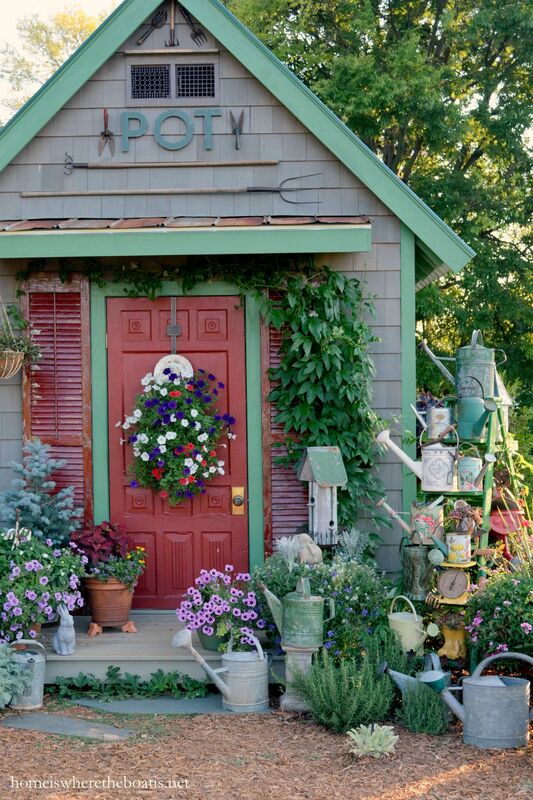 First, I’m just swooning of your rustic garden shed – love it! 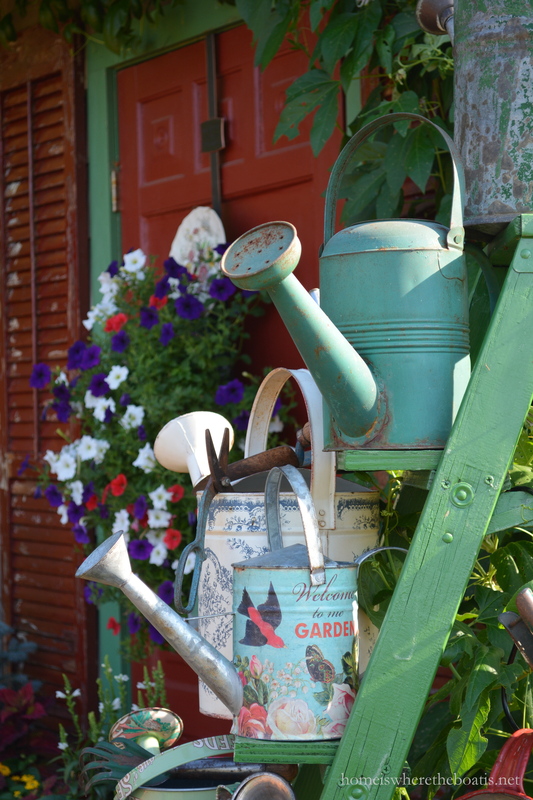 Your watering can collection is F-A-B-U-L-O-U-S and I like how you’ve arranged them in front of your shed. Following you! How in the world did I miss this post!! 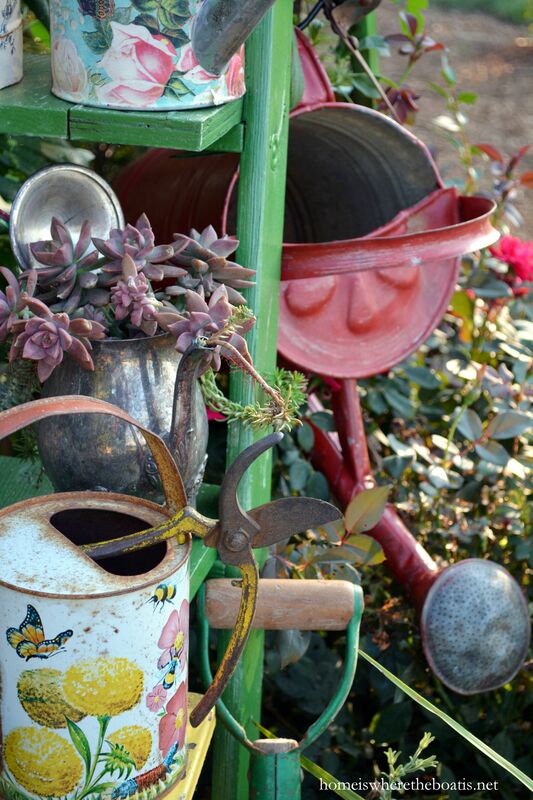 !….Severe, severe watering can envy and love….Adore each and every one of them! Yes, we need rain desperately here too!…. Your collection of watering cans is so nice. I love them too and have a nice stash on my back porch. My husband did buy me a new Hass Watering can with the nice brass rose and it is my most favorite one to actually water with. I am from Deland Florida and we are getting hit with some awesome rain in this area. My rain barrels are full to the brim.